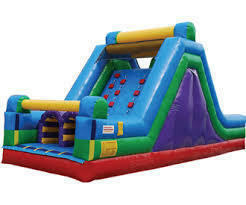 Standing 16' tall this rock climb and slide is a great way to challenge your friends at your next birthday party or event. It has crawl tubes, a rock wall, and slide. This obstacle can be rented alone or combine it with some of our other units to make the ultimate obstacle coarse.